Last weekend I heard the prosperity gospel, in a soft version, preached from the pulpit. We were visiting a church and the pastor declared (I paraphrase), "If you follow God's plan, you will prosper." It was toward the end of the sermon, when he was tacking on some duties that the congregation should perform (pray more, witness more, etc.). He certainly wasn't going full prosperity gospel, but it reflected the notion that if you do the right things, then God's got your back and will make everything work out. That formula is an easy one to slip into, but it is so very dangerous. God doesn't usually make it easy for his most faithful servants, at least not according to what Scripture tells us. In fact, there is a regular pattern in Scripture that those whom God uses most suffer the most deeply. Our hearts long for ease, but our usefulness to God requires a constant striving, which inevitably entails struggle. There is danger of a soft prosperity gospel in our lives each day because, in reality, we all want it to be true. The problem with the prosperity gospel is that it teaches us that only when we are comfortable are we being blessed by God. That teaching can lead to despair when things aren't going our way. The soft prosperity gospel is a constant danger to most believers, particularly American Christians, but there is a bigger, darker problem that has arisen in the heart of the wealth of America. That problem is the full-fledged, all-out prosperity gospel. Most proponents of the prosperity gospel have learned to mask their message carefully, at least in public forums, since there has been a tendency among orthodox theologians and pastors to call them out. However, recently Creflo Dollar made the mistake of being open about his understanding of Christianity on Twitter. He, or someone who has the keys to his account, posted a Tweet that read, "Jesus bled and died for us so that we can lay claim to the promise of financial prosperity. #ProsperityInChrist #WealthyLiving"
Dollar deleted the Tweet after being bombarded by negative comments. This screen capture was taken in anticipation of that on 8 Oct 2015. Sometimes people delete tweets because they are ambiguous and can be misinterpreted. Sometimes they are deleted because of typos or because they have a dead link in them. Dollar, or someone on his team, deleted this tweet because it was not sufficiently ambiguous. The veil was drawn back on the prosperity gospel. The message was made more clear than simply a promise of living "your best life now" and the true belief system was brought to the surface. Deleting this tweet was an admission of guilt on the part of Creflo Dollar. The purpose of this post is to point out the potential error and to point toward some resources for understanding and dealing with the theology of the prosperity gospel. The prosperity gospel, in many forms, is alive and well; we need to kill it in our hearts and help others to see what it really is. Here are some helpful resources for understanding and confronting the prosperity gospel in your own heart and in the world around you. What is the Prosperity Gospel, by Andrew Spencer. Is the Prosperity Gospel Biblically Sound, by Andrew Spencer. The Importance of Rejecting the Prosperity Gospel, by Andrew Spencer. Errors of the Prosperity Gospel, by David W. Jones. The Prosperity Gospel in My Own Heart, by David W. Jones. The Poverty of the Prosperity Gospel, by Vaneetha Rendall. Six Keys to Detecting the Prosperity Gospel, by John Piper. The Prosperity Gospel: Decietful and Deadly, by John Piper. How to Help Friends Escape the Prosperity Gospel, by John Piper. Whenever someone writes a blog in opposition to the prosperity gospel (assuming anyone reads it), a backlash always comes from supporters of the individual criticized or the movement as a whole. Accusations are launched something to the effect that "Christians shouldn't attack other Christians," or "Have you followed Matthew 18?" The irony of commenters on blogs posting questions about Matthew 18 is often overlooked. True enough, I haven't approached Creflo Dollar in person to confront him with his sin. However, he posted it on Twitter, which means that he put his thoughts out there for public critique. For the first point, Christians should critique other people who claim to be Christians when they preach false doctrines. And when they do so publicly, that critique needs to be public. Paul (who was way more sanctified than I am) seems to have done just that to Peter when he was in error (Gal 2:11-13) with the hope of helping Peter and the believers that were caught in the theological error. Frankly, this latest tweet by Dollar is only a recent proclamation of what he has previously clearly stated in his sermons and books. In other words, this tweet isn't the issue; it's the broader theological movement. 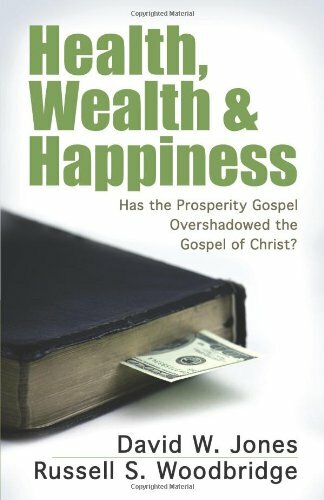 (A more sustained critique of Dollar and the prosperity gospel movement can be found in David W. Jones' book, Health, Wealth, and Happiness.). The move toward defensiveness of a person or a movement is natural for those deceived by the prosperity gospel (or any other false teaching). Dollar is a charismatic preacher and he offers hope of wealth to many that strongly desire it. But it is a hope built on false doctrine, so it isn't a true hope. However, maintaining doctrinal orthodoxy is vital to the health of the church. There is a reason that liberal denominations a dying. It's because their theology lacks the nutrients necessary to sustain them. Unfortunately, the prosperity gospel continues to flourish because of continued spiritual blindness by its adherents and much more careful (except with this tweet) presentation of the true nature of their message. However, it remains a mushroom religion--kept in the dark and fed on manure--that can't survive when trials come. Ultimately, the reason we should confront the prosperity gospel movement is not to win points on the internet, but because it is a false gospel. It presents the idea that Jesus came to make us wealthy. In reality, he came so that we could become holy. To lose that message is to lose the essence of God's gracious hope for the world. This is all the reason we should need to publicly and openly oppose this movement of false teaching. It reflects true neighbor love to those trapped in the movement or susceptible to its clutches.